Hua Hin has it all…white-sand beaches, outdoor sports, international cuisine, great shopping and welcoming people. My wife, Kirsten, and I recently took a trip there and were truly blown away by this idyllic seaside destination. It’s been the summer home of the Thai royal family for decades. In 1926 King Rama VII commissioned the building of Klai Kangwon Palace, the name translates to “far from worries” and that’s exactly how it feels here, sipping a refreshing cold drink on a beachfront terrace, watching the world go by. 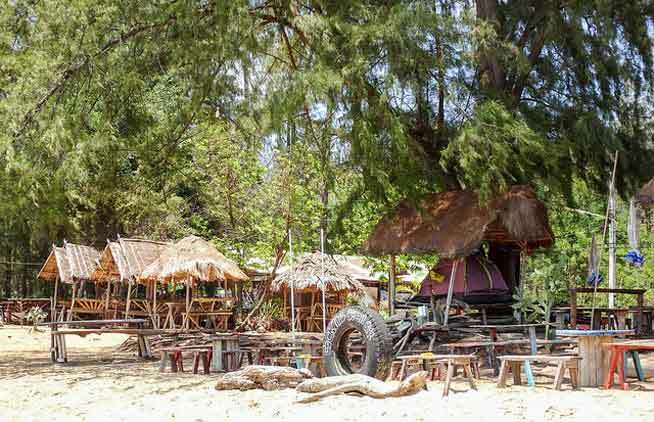 Three hours’ drive or so from the capital Bangkok, Hua Hin is a tourist hotspot. The town is home to 85,000 full-time residents, but local expats told us that figure can double on weekends and holidays. And it’s for this very reason that it’s also a great place to retire. Tourists mean shops, restaurants, activities, entertainment and good infrastructure—including three international hospitals with English-speaking staff and plans for a high-speed rail link between the town and Bangkok. While the town can be crowded, often with those looking to escape the summer heat of the bustling capital, there’s still a sense of calm here. It’s well organised and clean, and crime is virtually non-existent. If you’re looking to shop till you drop then Hua Hin Market Village has everything you could want, but Hua Hin residents will soon be spoiled for choice as an enormous shopping centre with a five-star hotel, a water park, some serious shopping space, a multi-screen cinema and a gourmet market is currently being built. Personally, I’ve always been a fan of the local markets and impressed by the quality of the goods—as well as the reasonable prices. Hua Hin’s most famous is the Cicada Market, home to artists, an outdoor bar and entertainment venue and, of course, dozens and dozens of food stalls. The food scene here is excellent, and you don’t need a king’s ransom to enjoy it. We ate local food just about every day and averaged $8 for breakfast for two, about $12 for lunch and $15 for dinner (all without alcohol). But when we fancied a change we found every option we could think of. Foodie highlights included breakfast at a German Bakery—I can still smell the terrific, rich coffee and warm, freshly baked bread—and dinner in the traditional Greek Taverna where we feasted upon spicy souvlaki, roasted lamb and delicate flaky pastry desserts. Working off all the delicious food isn’t a problem, there’s biking, trekking and watersports—including world class kite surfing—on the doorstep. If golf is your game, you’re in luck as this is one of Thailand’s best golfing destinations with the championship Black Mountain Golf Course, regarded as one of the best in Asia, as well as six other quality courses and three driving ranges all close by. A round at one of the local courses costs $60—including cart and caddie fees, while green fees at the championship course run to $140. Sign up here for IL Australia’s e-letter and we’ll send you a free postcard e-letter three times a week. We’ll also send you a FREE research report on Thailand: Live Like Royalty in the Land of Smiles.